Motorola has officially announced the Xoom 2 and Xoom 2 Media Edition today. The Xoom 2 has a 1.2GHz dual-core processor, 1GB of RAM, 16GB of storage, and a 10.1-inch display. It runs on Android 3.2 Honeycomb though I am expecting Ice Cream Sandwich firmware later. It also offers 5 megapixel front and 1.3 megapixel rear-facing cameras. Motorola Xoom 2 supports Motorola's new Splash-guard protection. Now something about its younger brother, Xoom 2 Media Edition. The Xoom 2 Media Edition features similar specs, except 8.2-inch display size. It has the same Gorilla Glass protection. It also promises a 20-percent improvement over the original Xoom in the graphics department, which, along with a 178 degree viewing angle make the tablet optimized for media consumption, as the name implies. Till now Motorola Xoom 2 and Xoom 2 Media Edition has only been announced in the UK and Ireland. We are hoping that Motorola Xoom 2 tablet will hit the retailers like Carphone Warehouse at the middle of November. In UK you can buy Motorola Xoom from Best Buy, Dixons, PC World and Currys too. But we don’t know the price of news Xoom tablet yet. You can find details about Motorola Xoom 2 tablet and register about newsletter on Motorola UK site. Time for the Press Release. LONDON – November 3, 2011 – Building on the success of Motorola XOOM™, Motorola Mobility is rocking the tablet world yet again with two additions that bring enhanced experiences to the European market. Wi-Fi variants of the Motorola XOOM 2™ and Motorola XOOM 2 Media Edition™ -- boasting powerful productivity, rich entertainment and customizable experiences -- are now available: the answer to consumers looking for a tablet that can keep up with their lifestyle. Both tablets will be available at Carphone Warehouse in the UK and Ireland, as well as Best Buy, Dixons, PC World and Currys in the UK. "Tablets are quickly becoming a must-have tool for staying connected, getting work done and having fun at home and on the road," said Victoria McManus, marketing director UK & Ireland, Motorola Mobility. "We are very excited about these two new additions to our tablet portfolio that build on the success of the original Motorola XOOM to now deliver more powerful tablet experiences to the European market." The new Motorola XOOM 2 and Motorola XOOM 2 Media Edition both feature Android 3.2, a dual-core 1.2 GHz processor, brilliant displays with Corning® Gorilla® Glass and a splashguard coating for a go anywhere, do everything attitude. In addition, both tablets include the new MotoCast™ app that lets you stream all your music, photos, videos and documents between your PC or Mac and tablet without any media tools, apps, or cords. Motorola XOOM 2 with Wi-Fi sports a 10.1-inch widescreen HD display and Android 3.2 Honeycomb like its predecessor, but the similarities end there. The display is brighter and more vibrant than before with colour enhancement, and the edges have been strategically designed to make the tablet more comfortable to hold -- this tablet is easy on the eyes, and easy on the hands. It is compatible with the optional Motorola Stylus that is great for note-taking, hand-writing emails and sketching. 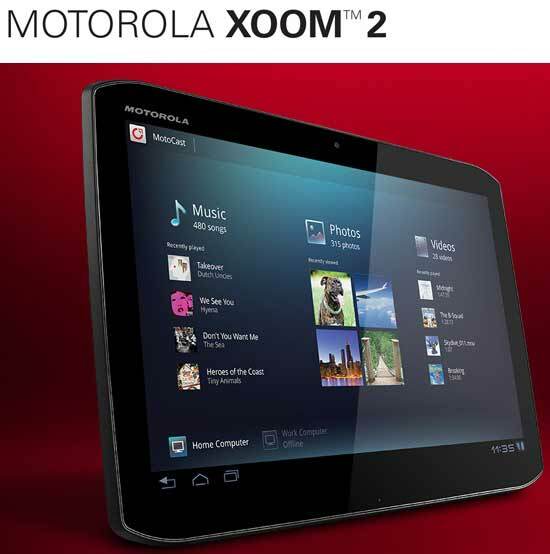 Motorola XOOM 2 is loaded with Business Ready features like VPN support and data encryption. Motorola XOOM 2 with Wi-Fi features MOTOPRINT integrated into key apps so you can print wirelessly from your tablet. It is approximately 100 grams lighter than the original Motorola XOOM to make it even easier to take on the road, and can withstand poolside use, spilled drinks or dashes out to the car in the rain thanks to its new splash-guard coating. A battery delivering more than 10 hours of video playback means it can go with you wherever you need to be. Motorola XOOM 2 Media Edition with Wi-Fi is easy to hold with one hand thanks to its 8.2-inch display, and easy to take with you wherever you go, weighing less than the best-selling paperback you've been carrying around. Optimised for entertainment, it has a wide, 178 degree viewing angle. Hold it up to someone across the room, or share it with someone sitting next to you, and everyone gets a brilliant view. Motorola XOOM 2 Media Edition has a 20 percent improvement in graphics performance over the original Motorola XOOM for smoother gaming, features adaptive virtual surround sound with booming bass that'll delight your ears, and stands out from the crowd with the fastest multi-tasking in its class. It can even be a universal remote control for home AV equipment with the personalized, custom remote control app pre-loaded on the tablet. Lastly, a splash-guard coating provides extra protection against the spills that are bound to happen when you're having fun. With the Work and Play kit, plug your tablet into the HD Multimedia Station to connect to your HDTV, speakers and other peripherals for large-screen entertainment. Get more done, faster with the included keyboard and mouse with Bluetooth technology. Now, when your tablet is docked, the Smart Controller lets you MC the show from the comfort of your couch. For Motorola XOOM 2, no accessory discussion is complete without mentioning the Motorola Stylus with Precision tip - your tablet's best friend.